Great chart from Bloomberg below providing a timeline of Chinese cities that are experiencing rising prices, no change or declines. 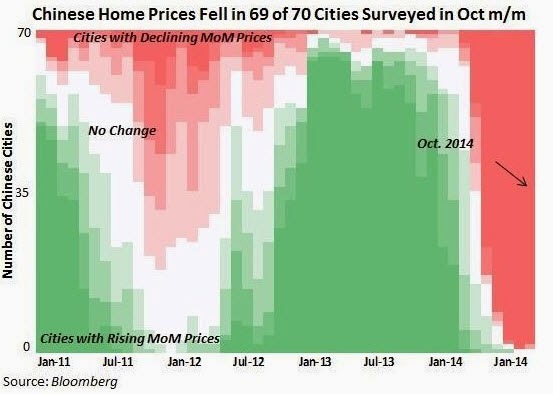 You can see during the last dip in prices during early 2012 it was only some of the cities experiencing price declines while in the most recent data 69 of the 70 cities were in decline month over month. This is obviously not good news for a Chinese economy that relies heavily on real estate development for growth or a global economy that relies heavily on exporting goods to China to feed that development.